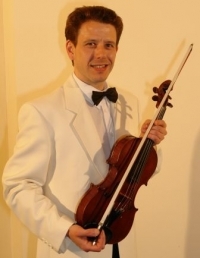 Solo violinist (with no accompaniment) – a light serenade of your favourite classical and popular tunes, drifting from table to table. Carefully selected repertoire to complement a Valentine’s Day Dinner, Birthday Celebration, Wedding Anniversary or other special occasion. Themed events for dinners on board ships have included: HMS Warrior, HM Royal Yacht Britannia and HMS Victory (see video clip below accompaning Bruce Forsyth dancing the Sailor’s Hornpipe).